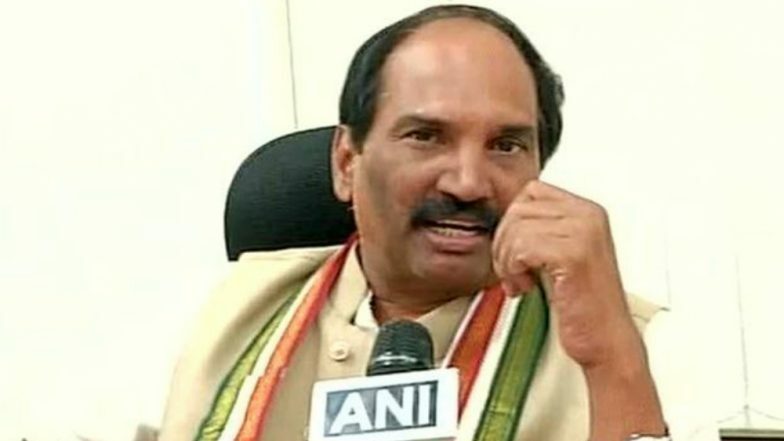 Hyderabad, March 19: Seeking to put up a keen fight in the Lok Sabha polls in Telangana after a disastrous show in the assembly elections in December last year, Congress has fielded its state unit chief N Uttam Kumar Reddy to boost the morale of its cadres and prospects. Reddy, sitting MLA from Huzurnagar, would be the party candidate from Nalgonda, according to the second list of candidates announced by Congress late on Monday night. Though he was initially said to be reluctant to contest, his candidature is, however, expected to boost the morale of partymen. The list also includes former MP Madhu Yashki Goud, who will take on TRS president Chief Minister K Chandrasekhar Rao's daughter and sitting MP Kavitha in Nizamabad. Firoz Khan, who unsuccessfully contested in the Assembly elections, would take on AIMIM president Asaduddin Owaisi. Telangana: CM K Chandrasekhar Rao Attacks Congress Over Land Survey in Assembly Session. Speculation had been rife that cricketer-turned-politician Mohammad Azharuddin would be fielded from Hyderabad to take on Owaisi. Former MP M Anjan Kumar Yadav (Secunderabad), who was unsuccessful in Secunderabad in 2014, has again been named the candidate from the same constituency. Former MP Mallu Ravi is the party candidate in Nagarkurnool-SC. The constituency is presently held by sitting Congress MP Nandi Yellaiah who has been denied a ticket this time. Telangana: Congress-led Alliance Intact, to Fight Lok Sabha Elections 2019 Together. Former MLA Ch Vamshichand Reddy, who was also unsuccessful in the Assembly polls, would try his luck in Mahabubnagar. Dommati Sambaiah has been named the candidate from Warangal-SC, while former MLA and minister Komatireddy Venkat Reddy would contest in Bhongir. The party had earlier released a list with eight candidates. The total number of seats in Telangana is 17. With the announcement of 16 nominees, only the candidate from Khammam remains to be announced. Former Union Minister Renuka Chowdhary is among the names under the consideration of the party leadership. Congress had won a major chunk of its MLA seats in the Assembly polls in Khammam region. However, some of the MLAs have quit the party in March and announced their decision to join the ruling TRS. Coming soon after the loss in the Assembly polls in December, the desertion of eight MLAs had left party cadres in the state disappointed. Congress had won only 19 seats in the 119-member House in the Assembly polls. However, as many as eight MLAs have announced that they would join TRS.